journalismthatmatters. All rights reserved.While I have worked with journalists since 1999, I am not a journalist. My engagement work in organizations and communities convinced me that an effective approach to change is through ‘story’. I came to journalism wondering whether what I knew about engagement might be of service to a storytelling profession that, I believe, has tremendous potential for positive societal change. In the last two to three years, I’ve seen journalism moving towards more community-centred approaches. Drawing from what my work with journalists and my engagement work has taught me, I offer what I see emerging from the soul-searching currently happening among those I am in touch with. For example, journalists at Elevate Engagement, a conference organized by the Agora Journalism Center and Journalism That Matters, a nonprofit I helped to found, acknowledged the destructive influence of journalism’s cultural narrative on African American communities as part of a conversation revisiting identity and purpose that is under way among many journalists. A classic definition of journalism’s mission is to provide citizens with the information they need to make the best possible decisions about their lives, their communities, their societies, and their governments. I offer a twist to that definition: to support communities to thrive, journalism provides people (not everyone is a citizen) with the information they need to make the best possible decisions about their lives, their communities, their societies, and their governments. Would stories that have contributed to fear of and despair in black communities been written the same way had they been done on behalf of thriving communities? I think not. 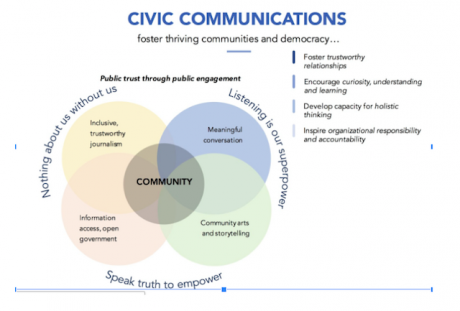 What would it mean if journalism committed to thriving communities? Shifts that are under way at the leading edge of local journalism shed some light on what’s possible. When community is at the heart, listening to the needs and aspirations of the people guides every aspect of the work – the stories chosen, who is interviewed, the questions asked, the forms stories take, how they are distributed, and how they are used. Several journalism startups help journalism organizations bring these ideas to life, connecting newsrooms with their communities to listen and learn. Notably, Hearken, and its founder, Jennifer Brandel, is having an impact, in many ways democratizing journalism’s editorial process by providing processes and platforms that integrate the public through all aspects of a newsroom’s story cycle. A few years ago, an editor friend was bemoaning the loss of a time when the front page of the daily paper provided a shared view of what was important to know. About that same time, a 2014 American Press Institute study found that only one-fourth of African Americans and one-third of Latinos believed their communities were accurately portrayed in news media. The American Society of News Editors has tracked newsroom diversity for almost 40 years. Since 2000, the workforce has remained about 87 percent% white. With such an overwhelmingly white makeup, it’s not surprising that they’ve missed stories that accurately reflect and matter to communities of color. Our communities are a tapestry. My work with change has taught me that a turning point occurs when we see ourselves in context. Journalism can help us understand one another and the complex weave of the many identities that make up our communities today. Startups, like the Seattle Globalist, which highlights diverse voices and trains the next generation of media makers while covering the connections between local and global issues for Seattle, or initiatives like the Rochester Democrat and Chronicle’s Unite Rochester, which is designed to raise awareness about race and racism, and inspire a more inclusive and creative approach to solving community problems, are helping us see richer pictures of our communities. I’ve learned that innovation thrives on diversity. If we wish to find breakthroughs to the challenges faced by our communities, then we need practices that transcend conflict, in which our differences become a source of creativity as we shift from homogenous to inclusive. Which leads to another critical shift that I am seeing in journalism today. Stories connect us by making visible deeper values we share, such as good health, good work, a place our families can thrive. They generate empathy as we see the humanity in each other. When we connect around the things that matter, our differences lead the way to ideas that draw from all of us, including what we want to conserve and how we seek to progress. …We recognize that people need experiences, connections and relationships, not just information. We start with curiosity and a desire to be a force for good through our storytelling and communication. We offer our own vulnerability and are willing to step out first into difficult conversations and situations. We are inclusive, bringing diverse stakeholders, partners and communities to the conversation. Quite a powerful stand from these journalists and their community colleagues! Engagement naturally leads to another promising trend in journalism. Generative stories, which illuminate possibilities, are a pivotal force for supporting communities to thrive. More than any shift in how journalism is done, I believe generative journalism could spark a renaissance of hope and increase public involvement in civic life. Particularly in our changing times, the current emphasis on problems often leaves people discouraged, frightened, or disconnected. Why else do people take media fasts? Journalism can help us navigate upheaval by emphasizing inquiry, ideas, and possibilities. To be clear, I am in no way suggesting we avoid complex, conflicted subjects. Any subject, no matter how serious or tragic, can be told through stories that engage, inspire, and activate the public. For example, InvestigateWest, a nonprofit investigative news organization, includes solutions as part of its approach. Their groundbreaking story on the hazards of chemotherapy exposure for health care workers resulted in passing two laws improving worker safety in Washington state. According to Rita Hibbard, executive director at the time, what made the difference were the possible solutions from other parts of the world contained in the story. In fact, she told me that in her thirty years of investigative reporting, that level of impact was almost unprecedented. Hard-hitting journalism that made a difference because it offered possibilities. An approach that is gaining traction in newsrooms is the Solutions Journalism Network (SJN), which trains journalists to cover how people respond to problems. While it still draws from a simplistic problem/solution mindset, SJN is making a real difference by making visible more of the whole story – not just the problem, but how people are addressing it. Journalism works best in partnership with other forms of civic communications. Meaningful, inclusive conversations, community arts and storytelling, information access and open government, also contribute to thriving communities. (Journalism that Matters, 2017). By collaborating with others, journalists help to cultivate a system of civic communication that equips the public with the structures it needs to see itself and its world. Some journalism organizations are experimenting with contributing to such meaningful conversations. One of my favorite examples involves journalism startup Spaceship Media, which works with news organizations to support meaningful conversations to bridge divides. In one of a series of projects with AL.com, they asked Alabama Trump voters to talk politics and values with California liberals, proving that civil conversations can be had. What excites me most about Spaceship Media is that it works at the intersection of generative journalism and meaningful conversation, with stories feeding the conversation, which sparks new stories, which, of course, inspires further conversation. It’s stretching civic engagement muscles for everyone. Given these new journalism forms and practices, what will it take to spread? Both journalists and the public have a role to play in reinventing journalism that supports communities to thrive. One bedrock element of their work that I see journalists grappling with is the ethics of engagement. When I listen to journalists talking about engagement, their biggest fear is that they’ll be perceived as advocates, something that is anathema for people trained to bring an objective stance to their work. I think this is the biggest shift in mindset for journalists to confront in order to provide the journalism communities need today. An unintended consequence of objectivity is a distancing so great that some communities find the stories out of touch with their needs, leaving them feeling unseen or misunderstood. I believe that this attitude, not new technologies, is the root of journalism’s disappearing audience. Ironically, during emergencies, journalists set aside their fears and put their talents to work on behalf of communities. In the aftermath of Hurricane Harvey, the Houston Chronicle opened its paywall and provided hard copy papers to shelters. Some stories are personal, many are inspiring, with pictures and descriptions of people helping each other, providing information on where they can get help and what people need. Change their minds about the essential purpose they serve and journalists – in partnership with community connectors – have the potential to be pivotal in turning us from a divided country to one that can hold multiple perspectives. 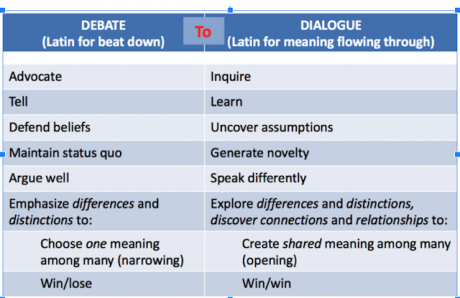 One way to help this shift is to move from “debate” to “dialogue” as our default mode of discourse. The win/lose dynamics of debate demands that we advocate for our “side". The exploratory dynamics of dialogue lead us to inquire, to seek to understand, to make connections, and to draw from many different perspectives to discover breakthroughs that none could have realized on their own. Stories that model and promote dialogue foster understanding, uncover possibilities, and inspire engagement, something that is often lost when focused only on conflict and advocacy. In Washington state, where the debate on education has made it to the state Supreme Court, dialogue inspired a group diverse in political perspective, race, socioeconomics, and age to realize that they could work together for an education system in which everyone felt they belonged. Along the way, a journalist who participated in the project was inspired to offer a possible solution to the shortage of black, male teachers, an issue raised during the effort: tap underemployed immigrant teachers. This was inclusive, engaged, generative journalism on behalf of community in action. - Seek out journalists and news organizations that are doing good work. Both Hearken and Solutions Journalism Network provide names of organizations they support. - When you find journalists and news organizations that are listening and doing good work, support them. Let them know. Subscribe. Reinforce good behavior. Tell family, friends, and groups that you are in. - If you have a story to tell, do so. Whether text, audio, video, or other media, provide content for a news outlet, your own blog, or social media. The Medium platform supports social connections, enabling anyone to build a following. If writing isn’t for you, find media that cover places and issues that matter to you and jump in. - Use social media -- like Twitter, Instagram, and Facebook – to discuss stories with friends and strangers. Or to share what you learn about using social media. Comment on stories that move you. Organize around them. In other words, make media, share it, and use it. - Invite diversity. We spend so much of our time with people like ourselves! Whenever you engage with media, notice who else needs to be involved and speak up. Reach out. Support media makers who tell stories that incorporate diverse perspectives. 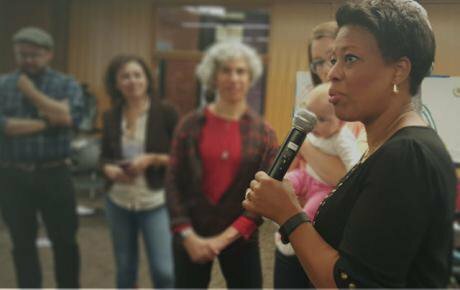 If you wish to engage with people from a different age, race, culture, etc., go to them. Be humble. Listen. Learn. They are more likely to join with you if they see that you are interested in a respectful partnership. - Learn about hosting conversations. The National Coalition for Dialogue and Deliberation and the Art of Hosting are great resources for practices and people. Ultimately, these actions are not just about the quality of our news and information. They are about cultivating societies that are compassionate, creative, and wise, and able to deal with whatever complexities come our way. Each of us has a role to play. So step in. This article was originally published in two parts on AllSides.com. AllSides uses crowd-driven, patented technology to identify bias in news sources, and showcases a variety of perspectives on any given issue to help build bridges between conflicting ideas and people.